It came as no surprise when it was announced that the all-new 2018 Jeep Wrangler is $3,000 more expensive than the outgoing model, with the Sport two-door carrying a base price of $28,190 including the destination charge. In fairness, you’re getting a highly capable off-roader for that price. Extensive use of aluminium has made it extremely light, and it also has an industry-leading approach angle of 44 degrees and a breakover angle of 27.8 degrees, as well as a departure angle of 37 degrees and ground clearance of 10.9 inches. Impressively, it can also drive through up to 30-inches of water and has a maximum towing capacity of around 3,500 lbs. Jeep has now launched an online configurator for the new Wrangler, allowing us to see how much the price increases once you start trawling through the extensive list of optional extras. Prices for the range-topping Unlimited Rubicon model start at $41,690, but load it up with a full set of optional extras and you’ll be charged a whopping $57,310. Jeep’s new eight-speed automatic transmission is one of the most expensive options, which adds an extra $2,000 to the MSRP over the standard six-speed manual. If you want LED lighting, that will cost you $895, while a trailer tow and HD electrical system adds another $795. An 8.4-inch infotainment system costs $1,295 and a dual top will set you back $2,195. All nine paint colors come as standard, but the four roof options hike the price up. The Premium Black Sunrider soft top costs $595, while the Premium Tan Sunrider soft top costs $795, and the Black Freedom three-piece hard top costs $1,095. Out of all of them, the Freedom three-piece hard top body color is the most expensive at $1,200. 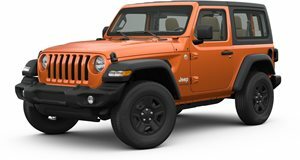 You can fit the new Wrangler with standard 17-inch polished wheels, or pay $795 for 17-inch black wheels with a polished lip. Both wheel options come wrapped in standard LT285/70R BSW off-road tires, but you can also add body color fenders flares for another $395. Sprucing up the interior also bumps the price up. Leather-trimmed bucket seats cost $1,495, while all-weather floor mats add an extra $130. A hard top headliner can be had for another $525, and remote proximity keyless entry costs $495. In total, that’s $15,620 worth of extras which brings the total up to $57,310 for the Unlimited Rubicon equipped with a 3.6-liter V6 including destination charge.